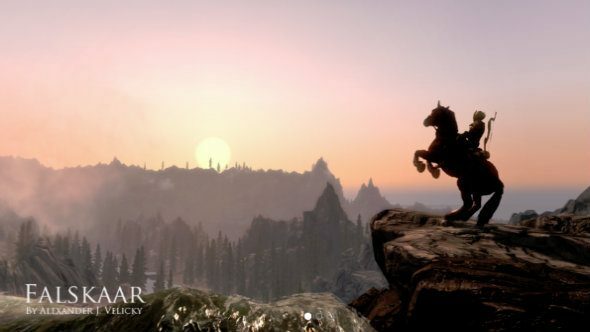 The big, ambitious Skyrim mod, Falskaar, has just released for the remaster, adding an entirely new, Nord-flavoured land to explore. To compliment Falskaar, here’s our picks of the best Skyrim mods. The mod went down well on the original Skyrim, and its port over to the Special Edition should allow a bunch of new people a chance to sample its Nordic wares. Created by Alexander J. Velicky, the mod adds that aforementioned landmass, complete with different points of interest, NPCs, and dungeons. Those NPCs are fully voiced, too. In other audio-related news, the soundtrack contains 14 brand new tracks composed by Adamm Khuevrr just for Falskaar, adding more than 40 minutes of new music. There are 26 new quests – nine for the main story and 17 side-quests – contained within, along with a new Dragon Shout and new spells. All-in-all, there’s around 20 hours of content. Have a watch of the trailer above for a taste. You can download Falskaar straight from Bethesda, or grab it on Nexus Mods.